Hello guys. Today I would like to overview Framer X Beta and break down a few examples. But first, let me introduce myself 🙂I’m a product designer in Farfetch. Together with Alexander Artsvuni we are currently working on prototyping Kit, we have ambitious goals, and we are trying to make prototyping easier and better — we are building a live design system, interactive. We already made a prototyping Kit in legacy Framer and now it’s time for Framer X. It will be a temporary article with a very short lifecycle (I think) and mostly technical. 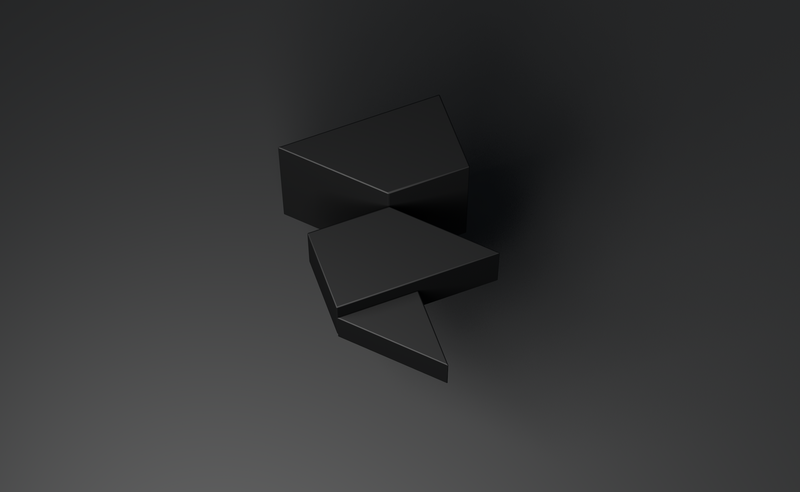 If you are looking for generalising article — what is Framer X, who is Framer X for etc. I would suggest you an article by John Traver or go to the end of the article and read the conclusion. So, we will talk about Framer X Beta, which means that the Framer guys are still working on it and a lot of things could be changed. Framer X is the place where design meets code 🙂 React.js in particularly. Current Beta is 5, and the new version has several cool features that community asked for. Besides Framer X we will also need to install additional tools like code editor or IDE (integrated development environment). 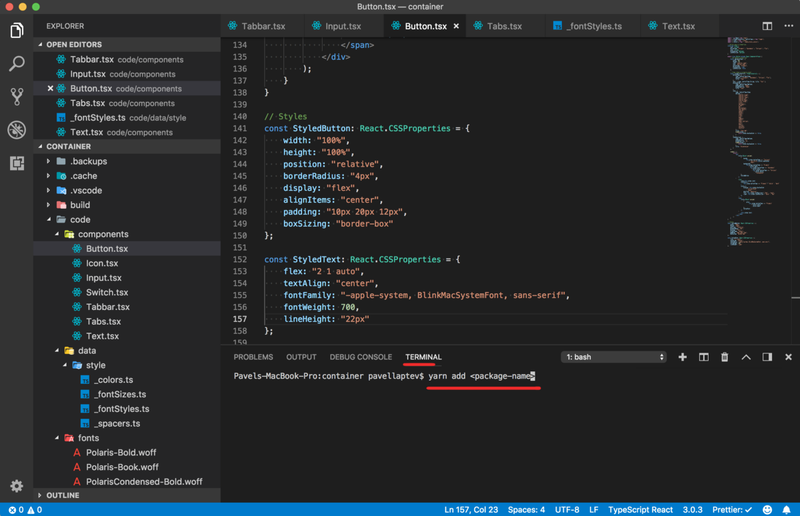 Visual Studio Code or VS Code is a source code editor developed by Microsoft. This IDE is better than Sublime Text or Atom because it has internal code validators, and also, TypeScript was made by Microsoft, so it will logical to use VS Code. 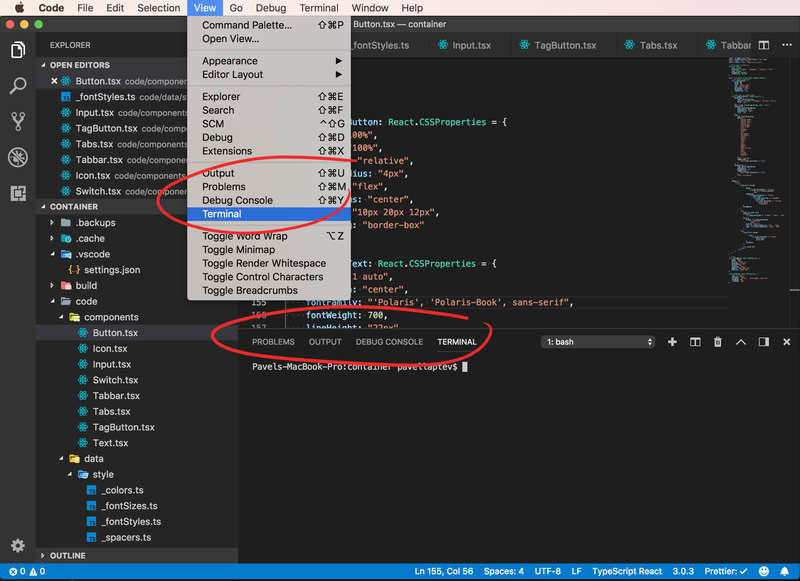 VS Code is a very customizable app with a wide variety of extensions. 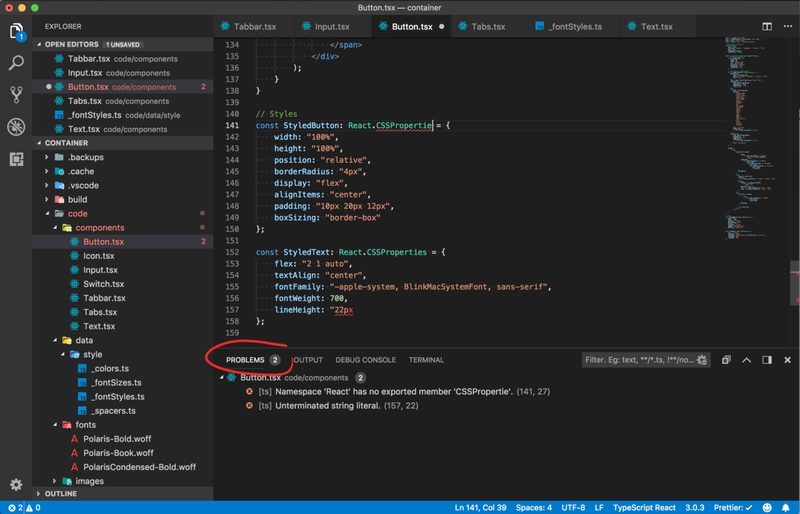 This VS Code plugin will make your code beautiful, and you don’t need to think about code layout, forgotten comas, and semicolons so much. Just press ⌘S. Only in this place you can understand what went wrong. Don’t try to write a working component without a console. Break down your component on several pieces and test each of it; try to transfer values in the console first, design and animation are the last things. Open Framer X → Open (create) your project → Press ⌥⌘P → Drag’n’Drop “container” folder into VS Code → Done! These are two important things to debug errors and install external modules. Because Framer X now has a single file or binary structure instead of folder structure, we can’t make little changes with different files and scripts in this file. This is still very fragile but you can open a Framer X project, File > Show Package and use the terminal to use yarn add <package> . Furthermore, Styled-component is not just a way to write a native CSS, it is also a conditional CSS. Here’s a short video on how to install and write simple styled components. Framer X so far doesn’t have an appropriate way to load custom local fonts (not google or some any cloud fonts, with web-fonts is pretty simple). We will use injectgGobal API method. A helper method to write global CSS. It does not return a component, but adds the styles to the stylesheet directly. To test a local font we should delete a local rule from @font-face otherwise your custom font wouldn’t be downloaded, browser will take the font directly from the OS. And, also, note the path to fonts. It’s very important — one extra dot or slash and your font wouldn’t download. After you successfully tested your custom font, don’t forget to return a local rule to the @font-face rule. Now let’s try to explain a few components, how they work. Line 12–14. States. What is it and what is the difference? To me the main difference is that “props” should not be changed while “states” can be changed — Mutable. So, in the Switch component we have only one state what we need to manage — Off or On. 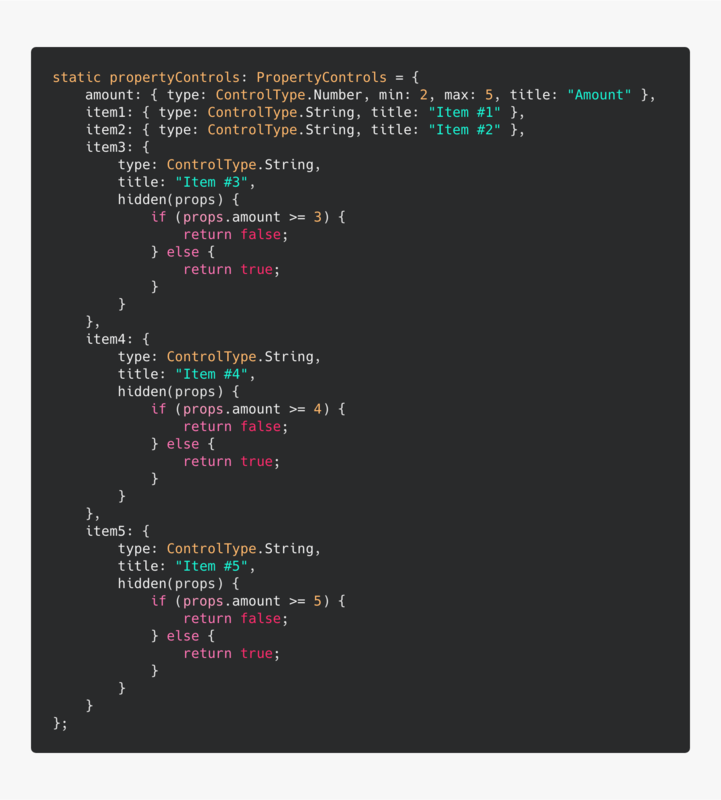 Like Props, in TypeScript, we also need to define a state type — on or off is a boolean type — and the the same property we have in props as we will use it in PropertyControls. Line 30–32. Setting up the initial state it can’t be a null object. Line 34–38. 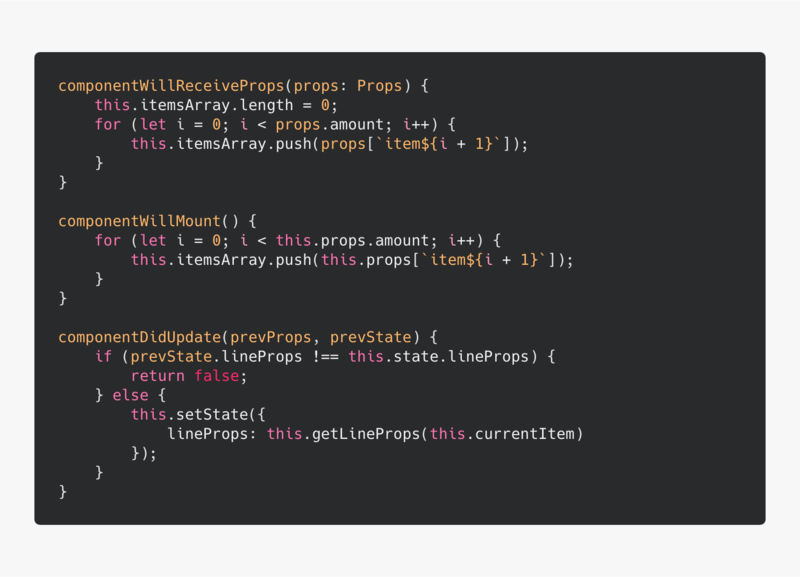 This piece about updating state based on props. We are binding “enabled” prop with “enabled” state. Line 40–44. handleClick function is a function where we will change the state. We will use this function with onClick event. 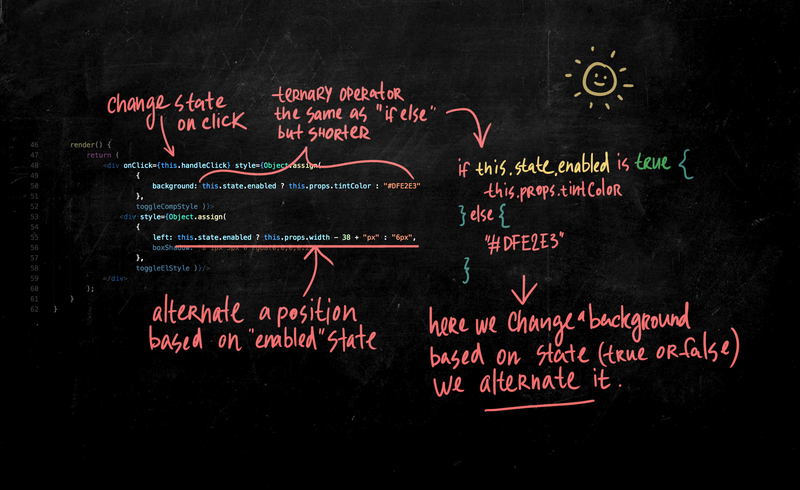 Here !this.state.enabled is an easy way to reverse a boolean value from true to false and vice versa. But where we change the style, colours and elements positions?
? this.props.width - 38 + "px"
boxShadow: "0 1px 5px 0 rgba(0,0,0,0.25)"
Another interesting component here. It’s much more complicated comparing to Switch component. We will install them through VS code terminal (watch section “Installation and work with Styled-components” above). item1 etc. — all items for the Tabs. I thought that five will be enough. Line 20–53. We create styled components. 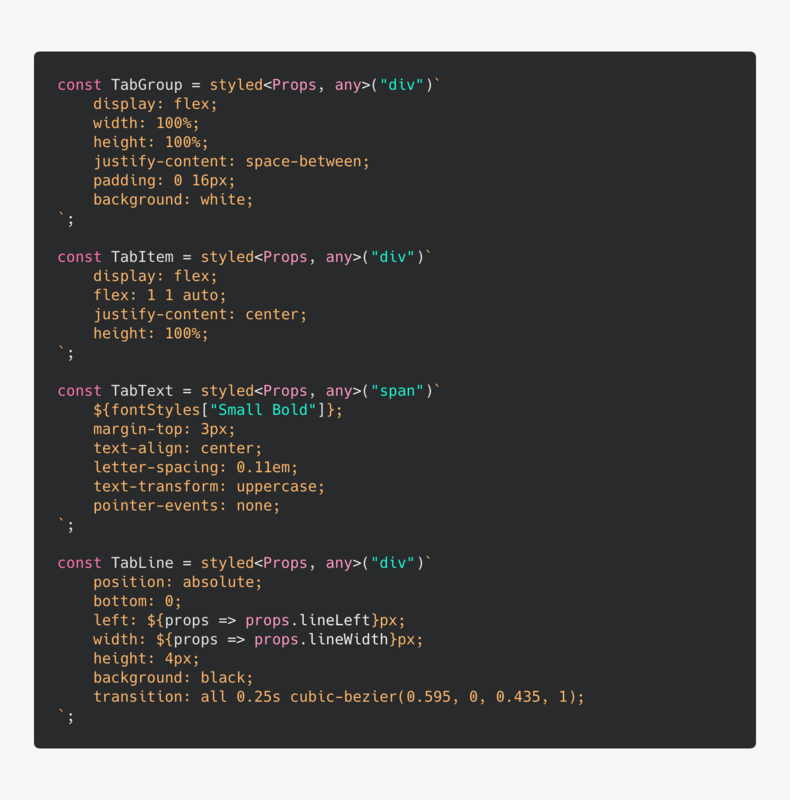 The idea of styled components is to use styles as an integral part of a component. In this case, we could also make our component without styled-component, but it’s good to try it. Line 69–116. First control will be amount. It will have a number type. Minimum items on the Tabs is two and max is five. Line 115–117. 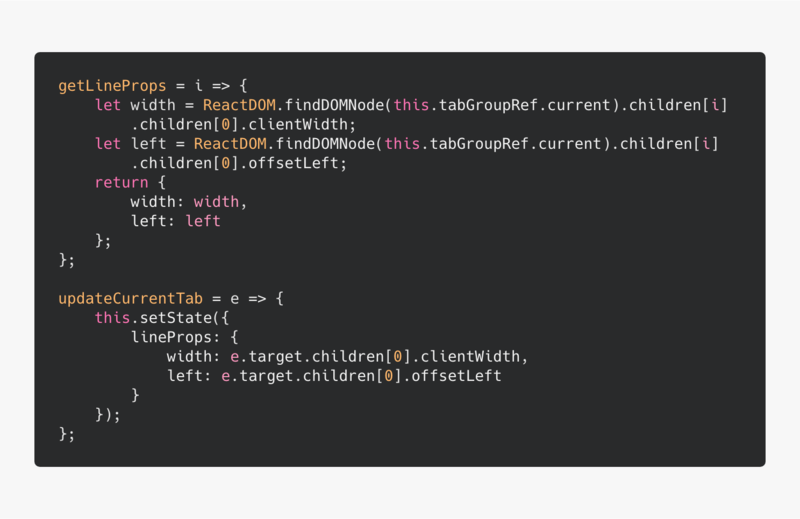 In order to get a DOM element in React we need to create a Ref attribute. This attribute we will apply to the parent Tabs element. Also, we create itemsArray. In this array we will store all our items from amount control. Line 118–136. In order to get underline new width and offset, we need two methods. First, getLineProps returns offset and width of the selected component as an objects. We will use this method after or before component will be mounted.We need this method for simultaneous update between the Framer preview and the canvas. Line 139–150. Next part is dedicated to the component lifecycle. componentWillReciveProps. For receiving new props from Framer controls before update. It’s our connection between controls and the component. We update component state through this method; any time when you change something by controls, this method will be called. Inside it, we clear our itemsArray on each update by controls and push new items inside it based on amount value. componentWillMount.Occurs only once when component will mount :-) So we also need to push here items inside itemsArrray. componentDidUpdate. In this phase we are checking previous state and current state of the underline, and if it was changed we are setting new props for the underline. This is the order of work methods in console. And done, our component is ready. 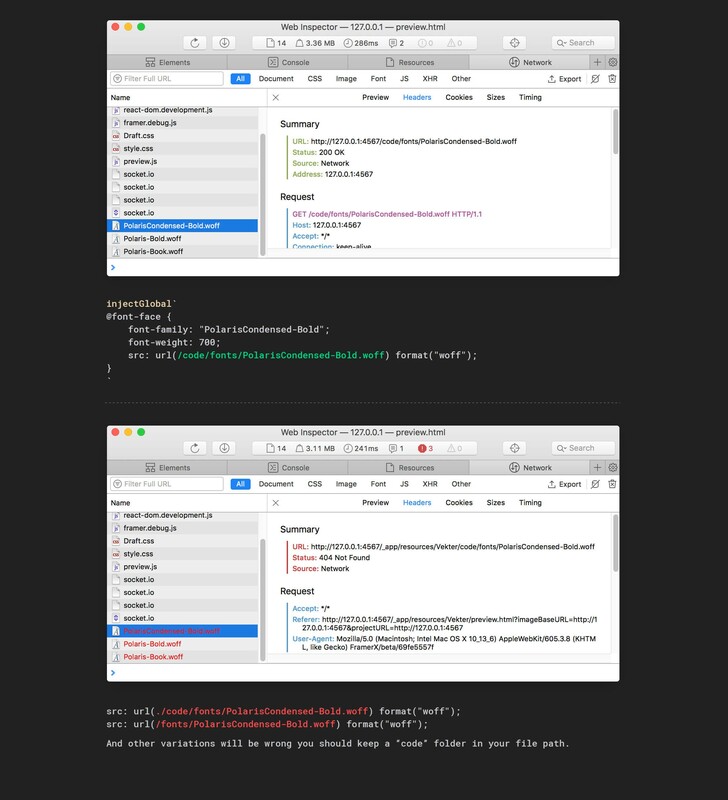 Framer X does not have “code abomination” under the hood. If you create a div element it will be just one, your div. In legacy Framer, in will be a div wrapped in a div inside a div wrapped in another div, which was very harmful to performance. All new standards. Yeah, perhaps we don’t have cool CoffeeScript syntax, but we became much closer to modern development and can use all advantages from it (I hope the will keep this approach). yarn add <somepackage> yes, please. Opportunity to work with native HTML elements. If you need an input —no problemo, just create it as a usual HTML tag. 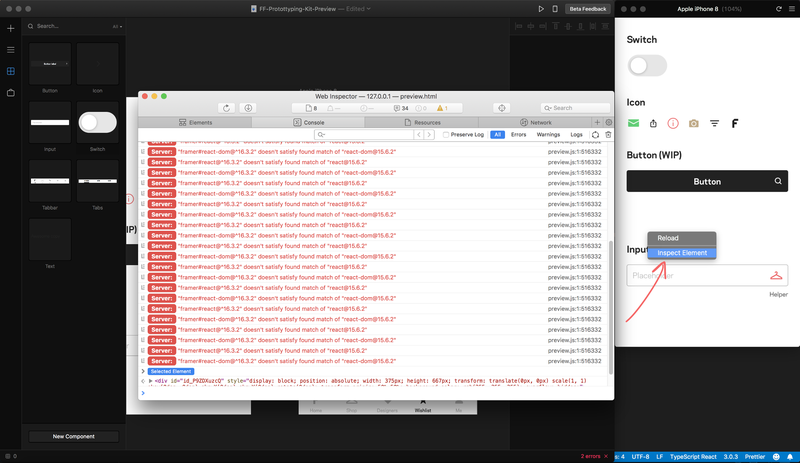 In legacy Framer, oh boy, you have to install an external module for this. Of course, someone could argue with it and say, “No! I want my old Framer, the animation was much easier here.” Yeah, it might be, but Framer always was about something more than a simple animation. Сhanges are good, it means that we think about the future.